A computer scientist at the University of Southern California and two Swedish linguists have cracked a 75,000-character cipher from the 18th century that described the laws of a secret society. The "Copiale Cipher" was neatly hand-written in Greek and Roman characters with some unknown symbols thrown into the mix. Researchers suspected that the original language was German, since the manuscript was found in Berlin, but they tried to match the manuscript with dozens of languages by running different "computer attacks" on the code, all to no avail. As they explain in their paper, the researchers' first theory was that the Roman letters contained the true message, with all the other characters serving as distractions, or "nulls." It turned out their hypothesis was completely wrong. After running the cipher through the computer program, the researchers realized that their assumption was backwards--that the Roman characters were, in fact, the nulls. Even after the code-breakers found and translated most of the unknown characters into letters, a handful of symbols remained mysterious. The researchers believe that these symbols stand for top-secret people in the society. 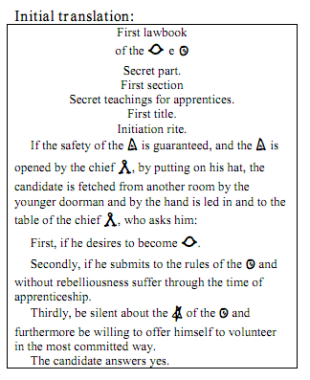 The manuscript described how to initiate new members into the society and other rules. Computer scientist Kevin Knight of the USC Viterbi School of Engineering told Science Daily that the secret society members shared a fascination with eye surgery. Other possible affiliations shared among the code-sharing knowledge elite remain speculative, however. "Historians believe that secret societies have had a role in revolutions, but all that is yet to be worked out," Knight said. "And a big part of the reason is because so many documents are enciphered." There's been a bit of a run lately in claims to break prominent and/or notorious ciphers. In July, an amateur code-breaker claimed to have cracked the messages of the "Zodiac Killer." Interesting. You wonder about the Masons maybe? Do not annoy the mama alligator before crossing the intergalatic swamp! She takes prisoners when annoyed!